At 33,000 feet, two hours west of Denver, flight attendant Joan Silvers stopped pouring coffee into paper cups. She sniffed the air. Joan explored the galley at the front of the plane. The plane shook once and dipped in altitude. The coffee slopped over the sides of the cups. Joan expanded her search to the door of the rest room. She put her nose next to the edge of the door. Inside the small bathroom, John Gilmore waved his hand through a smoke cloud in an effort to disperse it. He stood up, opened the lid to the toilet and tossed the cigarette in. Then he shut the lid. “I’m just about done,” he said. Gilmore waited a few minutes before opening the door. “Ma’am, I can explain,” said John. John walked back to his seat about mid-plane. The aircraft was full. The flight had left behind the front range wind currents over Denver. At John’s row of seats, a man was nodding off in the window seat. The middle seat contained a woman in her mid-fifties. Her head was bowed and her eyes were closed. When John had gone to the restroom, she had her hands clasped together in a death grip. They were still a bright shade of white when he returned. “I can’t stand these flights out of Denver,” she said. The woman looked at him, then at her hands. She released her grip and cupped her hands on her knees. “One…two…” She slowly got to her little finger on her right hand. John followed her to a seat on the front row. He left behind the snoring seat-mate and the woman who re-clasped her hands. “Thank you for moving, sir,” said Joan to the displeased passenger. A young boy wearing a Yankee’s baseball cap sat in the middle seat of the first row. A man, apparently his father, sat next to the window. The kid looked straight ahead, staring at the wall in front of him. “Did you have fun?” John asked the kid. “Yeah.” He resumed his stare. “You look a little old to be in the big leagues,” the father said. 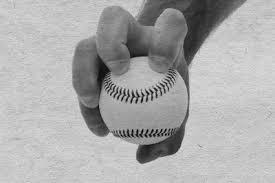 The boy reached into his jacket pocket and pulled out a baseball. John grasped it and showed Donnie the claw-like grip of a knuckleball pitcher. “I’ve heard of that name, but wasn’t he pitching in the ’60′s?” asked the father. Joan turned away from the passengers and rolled her eyes. The kid handed his baseball to John. The big leaguer pulled a magic marker out of his shirt pocket and signed it. Mr. Wilhelm, did your dad play for the Angels? No, kid, he pitched for the Indians. Have you ever struck out Jeter? Yup, I have. A couple of times, maybe three. The door to the flight deck opened, and Rhonda leaned out to speak to Joan. They both used their hands to shield their mouths like a coach and pitcher do on a trip to the mound. The conference ended with Rhonda returning to the cabin and Joan picking up a microphone. She took a deeper breath than usual and pasted her comforting smile on. Your attention please. Could I ask if there is a doctor on the plane? We need some medical advice in the cockpit. John looked at the flight attendant. A well-dressed man near the front of the plane raised his hand, and the attendant guided him into to the pilot’s cabin. Passengers looked and pointed and ripples of concern flowed to the back of the plane. “Is someone sick? the kid asked. His father replied, “somebody in the flight cabin, I would suspect. Joan pointed at John and motioned him back to his seat in the front row. John pointed to the woman next to him. The attendant waved him back again. When Gilmore reached his front row seat, Joan went into the cabin and shut the door. The kid turned the autographed ball over and over in his hands. His father recommended he put it away to avoid smudging the signature. “What’s wrong with the pilot? the kid asked. “Oh, he probably eats in a lot of different restaurants. His stomach is probably upset, ” said John. He felt the plane nose down and lean right ever so slightly. Joyce emerged from the cabin and reached for the microphone. She lowered her head and John saw her take a deep breath and come up with her best smile. Gasps came from the passengers. Joan’s eyes searched the seats for a hand raised, but none did. Eventually her scan reached the front row where John sat. Their eyes met. John stood up. Silvers led Gilmore into the cabin, side-stepping the doctor performing CPR on the pilot. The co-pilot was sitting with his hands on his knees and his gaze straight ahead. The co-pilot made no response. Hill remained still. John searched the myriad of switches in front of him. He found a cluster of buttons with five channels listed. Channel 1 was lit. He lifted his hand and pointed at the buttons. John looked over at Hill and tapped his shoulder. The co-pilot didn’t move. Hill’s head turned slightly towards Gilmore and then back. Again, to John, and back. His lips moved, but no words came out. Hill pointed to the instrument panel at the readout that said two-two-five. “How do I get that to 230?” asked John. Hill placed his hand on the controls. Firetrucks and ambulances gathered near the end of runway twenty-one. They saw the airplane on final approach. It was bobbing and weaving as was customary at McClarren International Airport. The plane dipped, and the passengers gasped. The sound from beneath the airplane worried the riders. At 300 feet, the flight was still rocking back and forth. At the beginning of the runway, the plane was still at 300 feet. It bounced once, and then hit the ground hard. Immediately the flaps tilted up and the brakes were applied hard. The plane rolled to the end of the runway and stopped. An ambulance quickly approached. Emergency technicians entered the cabin and removed the captain. “Okay, I’m ready for those ground authorities,” John said to Joan. “You’re a poker player, too?” asked Joan. John lifted his bag out of the overhead. Joan’s lips slowly changed to a smile. One she didn’t learn in training. Fun story, bit I couldn’t figure out who Joyce was, unless that was Joan’s middle name. Mike, I have an explanation, but must wait until next week to explain. The creative process is slow. Thanks for noticing!